Omnipure Granulated Carbon Coconut (GAC) has long been utilized to reduce impurities in potable water. It is widely recognized for its adsorption capacity plus its ability to reduce dissolved organics and chemicals such as chlorine. These and other impurities can cause undesirable taste, odor and color in water. 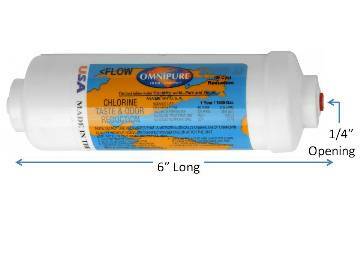 Cap and body of the Omnipure In line Filters are spin-welded together producing a smooth, consistent seal without the use of glues or binders that can cause contamination. This K2340JJ model is conveniently compact for tight spaces and still has a service life of 1000 Gallons or 1 Year. The is an 12x40 Mesh with 3/8" Quick Connect Fittings.